My first visit to Copan Ruinas Honduras back in 1993. I was instantly fell in love with the town! Copan Ruinas is a lovely colonial town with cobblestone streets, red tile roofs and friendly people. But not much to do other than archaeology, which is by the way, World Class. I came back to Copan Ruinas Honduras for Christmas 2015, I find than many things have changed in the past 24 years. However, Copan is still a lovely town that retains all of the charm it had when we first met! I could even say that there is magic in Copan! Over the years several new museums have opened their doors. The magnificent Macaw Mountain Bird Park has added a whole new dimension to the Copan Ruinas Honduras experience. The Copan Archaeological Park celebrates 35 years as a UNESCO World Heritage site this year. I did not think it was possible, but it is! A unique and very ambitious project to repopulate the Copan Valley with Scarlet Macaws, has been very successful. These birds, venerated by the ancient Maya, are now flying all over the park! As you walk into the Copan Archaeological Park, a dozen or so scarlet macaws will greet you. Having them buzz over your head is truly a unique and exciting experience. Small boutique hotels, charming restaurants and bars, including a micro brewery have also added to a nice variety that enhances your visit to Copan Ruinas Honduras. A brand new airport, which is still not operating with scheduled flights, promises to make getting to Copan much easier. Flights should soon be flying from gateways such as Guatemala City, Tegucigalpa, La Ceiba and Roatan. The biggest mistake you can make when visiting Copan Ruinas Honduras is not spending enough time there. Make sure you plan on spending several days in Copan. Two nights is the bare minimum, although you could easily spend 4 nights and not regret a moment of it! 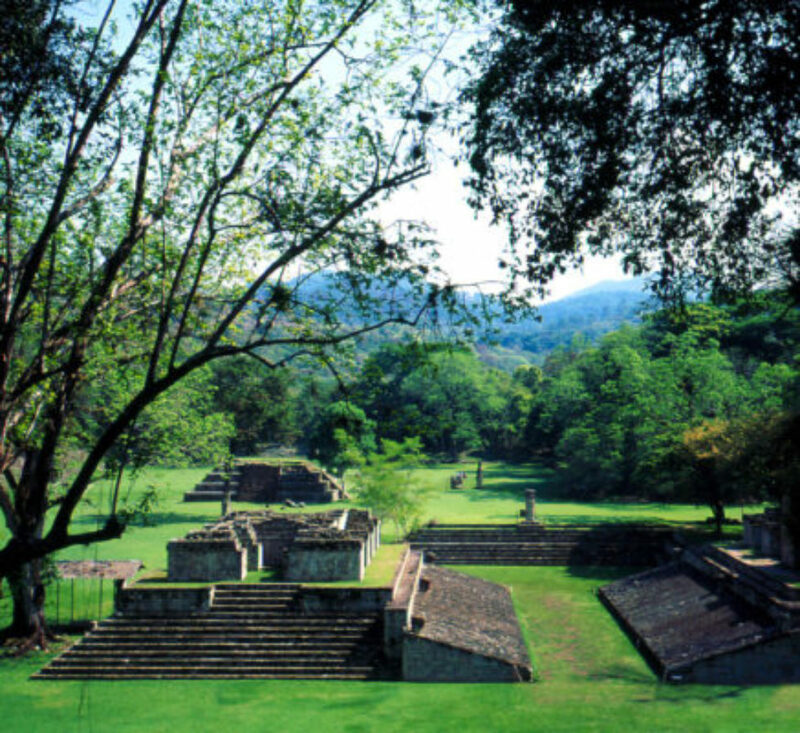 Copan Ruinas is one of the shining stars for tourism in Central America. The new airport will make it a whole lot easier to get to! Last, but not least, you will be surprised at how many banking alternatives are available in Copan Ruinas. It is clear that Copan Ruinas is one of the top 5 destinations in Honduras. Make sure you visit it! You will not be disappointing!